Did you catch subtle 'Peace for Paris' tribute on Sunday's 'Simpsons' episode? “The Simpsons” sent a message for peace in Paris on Sunday’s episode, but it was so subtle, viewers may have blinked and missed it. As Mashable noticed, the tribute came about halfway through the episode titled “Lisa with an ‘S,'” in which the middle Simpsons child visited Broadway in New York City. 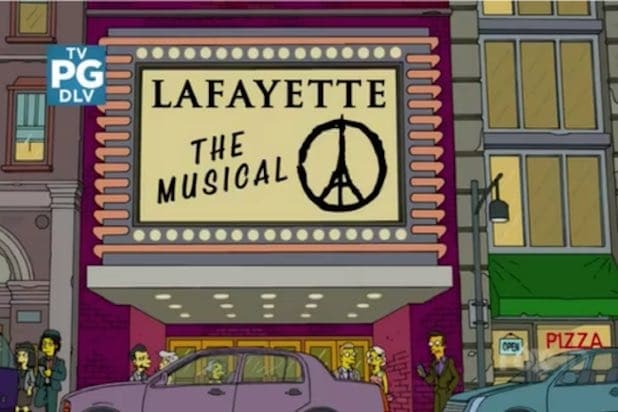 Marquees for several playhouses flashed upon her arrival, but it was one in particular for a production called “Lafayette” that warmed viewers’ hearts, as it featured artist Jean Jullien’s “Peace for Paris” design which seamlessly integrates the Eiffel Tower into the peace symbol. Take a look at the moment in “The Simpsons” below, followed by Jullien’s original art, which was retweeted nearly 60,000 times.